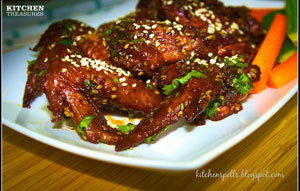 Check out the recipe for tasty chicken wings. Garnishing with Sesame and coriander leaves gives the dish its additional punch. Clean the chicken wings thoroughly and set aside to drain off any excess water. 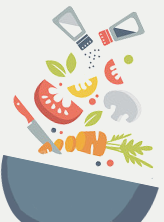 Prepare the marinade by mixing together the chilly powder, pepper powder, salt and olive oil. Prepare the marinade by mixing together the chilly powder, pepper powder, salt and olive oil. Marinate the chicken and let it rest for an hour. Meanwhile pre -heat the oven at 180 degree centigrade for 15 minutes. Alternatively, you can also fry the wings. Transfer the wings onto a baking tray and randomly toss in the crushed garlic cloves and bake it at 180 degree for first 35 minutes and rest 10 minutes at 200 degree centigrade for a crispier outside or fry the chicken wings in a pan until crisp. Remove from the oven and keep the tray covered with aluminium foil for 15 minutes. Dry roast the sesame seeds and set aside. In a pan, heat the oil and saute the garlic until cooked. Pour in the soya sauce and turn off the flame. Add the honey and mix this sauce well. Add the baked wings along with the juice oozed out on baking to the pan and coat the wings well with the sauce. For the final touches, add the roasted sesame seeds and finely chopped coriander leaves.